On Monday, April 10, Campbell Student Union Social Hall will be filled with T-shirts bearing messages of support for sexual assault victims. 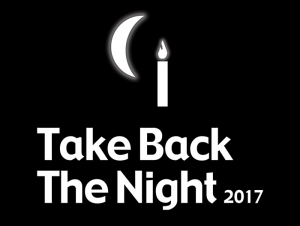 Buffalo State’s celebration of Take Back the Night (TBTN) will include student poetry, dance, songs, and testimonials, and will begin at 6:30 p.m. Doors open at 6:00 p.m. It is free and open to the public. Paula Madrigal, assistant director of prevention and health promotions for the Weigel Health Center, said the theme emerged from a conversation among students who noted that victim-blaming and shaming still occurs, despite an increased focus on consent and the reality of sexual assault. As part of TBTN, Weigel and the Student Life Office are co-sponsoring a T-shirt-decorating contest. Any student group or organizations can participate. All T-shirts will be entered for a gift card and will be displayed in the Social Hall. Additionally, to recognize Sexual Assault Awareness Month, Residence Life is coordinating a window-decorating contest. At the beginning of April, students will decorate campus with teal ribbons and Rockwell Hall's bell tower will be illuminated in teal, the color representing the month. There will be workshops and programs throughout April culminating with the Crisis Services fundraiser Walk a Mile in Her Shoes on April 30, which benefits victims of sexual and domestic violence. For more information about TBTN or Sexual Assault Awareness Month, call (716) 878-4719 or email madrigpa@buffalostate.edu.